I tried French onion soup once in a chain restaurant 7 years ago, that was the first time and last time for me. Since that bad experience, I told my husband this soup would never make it in my kitchen. One day out of nowhere, my husband had this soup in mind and requested it for dinner. So much for the “never” like many things, I made this super easy and crazy good French onion soup to go with a spring mix salad. It was a hit and changed my opinion of French Onion Soup forever. 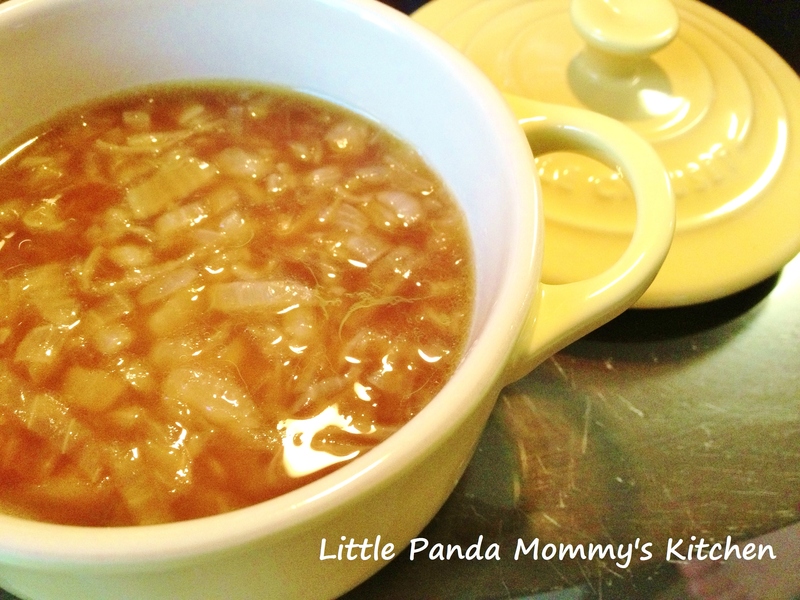 My daughters loved it so much, they asked me to make this soup just a few day later. This healthy and yummy soup need 3 ingredients only and take less than 30 minutes from scratch to the table. 1. In a pot, add olive oil over medium heat until very hot (smoking). 3. Add beef stock and stir well. Lid on until the soup comes to a boil. Lower heat to medium low and cook for 10 minutes. Heat off and serve. 4. Add salt, shredded cheese and croutons if desired. This entry was posted in Cast Iron Recipe, Easy Cooking, Healthy Eat, Le Creuset Recipe, Meal in 30 minutes, Soup Recipes and tagged Cast Iron Recipe, Easy Cooking, Easy French onion soup recipe, Healthy Eat, Le Creuset Recipe, Meal in 30 minutes, Soup Recipes on August 24, 2013 by littlepandamommy.